Traditional publishing runs on rails, most of the time. One of the strongest assumptions I faced when trying to become published, and stay published, was that a protagonist must be sympathetic. By that, it's meant, that the reader must identify with and basically like the protagonist. It's one of the publishing gatekeepers' toughest padlocks, try rattling it and see how secure it is. I did. And got nowhere. Well, that's not entirely true. I got to make Gus Dury about as close to an unpleasant pain in the arse as you can get, and, Rob Brennan isn't exactly all sunshine and roses. But, there's a world of difference between having a few flaws and being downright unsympathetic. Even Hannibal the Cannibal had a connoisseur's taste in wine and an erudite hinterland to make him more, well, human. But being a gruff Scot, brought up on protagonists like Irvine Welsh's hardcase Begbie and William McIlvanney's meat and potatoes man, Laidlaw made me wince at the niceties of some protagonists' sympathetic antics. Why, I wondered, could Begbie throw a pint glass over his shoulder, slicing a young girl's face to shreds in the process, and still be a fascinating character to follow? I mean, who's going to tell a writer of Welsh's standard that his characters are not nice enough. The idea is laughable. There you go then, I wasn't alone in having little or no sympathy with sympathetic characters. Much as I understand the logic of commercial publishing's drive for universally acceptable protagonists, it's not the only logic on offer in this debate. If a sympathetic character can carry a story, keep a reader turning the pages to the end in order to see if the good guy beats the bad guy, or the boy gets the girl, then the opposite can be true. An entirely unsympathetic character can also hook a reader to the last page to see if they get their comeuppance for bad deeds. And so The Ringer was born. Or more precisely, my unsympathetic protagonist, Stauner. I didn't begin with a list of unwholesome traits to give him, or a tangle of thorny situations to put him in, my aim was only to show his story, from his point of view, with no holds barred. I know if I'd submitted my book to a traditional publisher Stauner would be a turnoff. The days of publishers taking chances are long gone (even Welsh admits Trainspotting would never be published now). I'd be asked to tone him down, to make him nicer, insert a few scenes where he metaphorically helps old ladies across the road. But that would ruin him, and the book. The only way to tell Stauner's story, the only way to expose him to the reader, was warts and all. And so that's what I did. He may not be a nice guy, you may not want to hang with him, go for a beer, but that doesn't stop you being swept up in his train-wreck of a tale. The Ringer is available as eBook and paperback from Amazon UK and Amazon USA now. 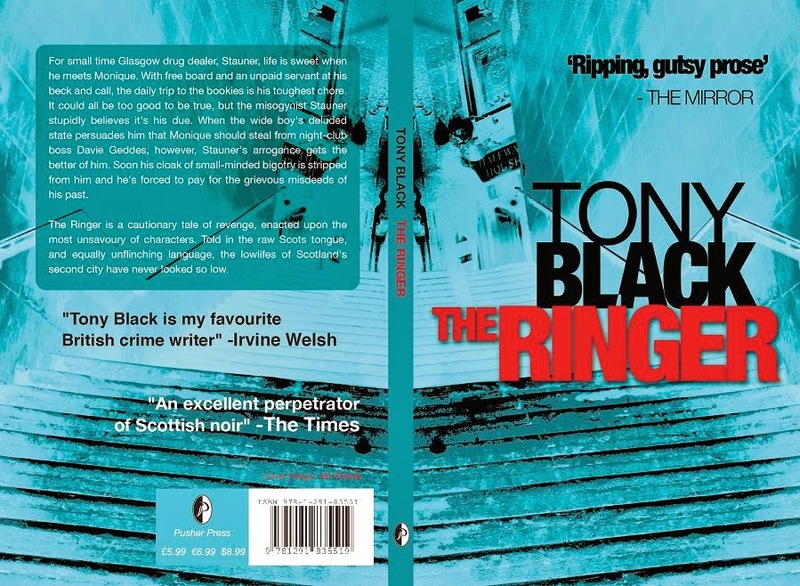 Bio: Tony Black has also written three crime fiction series, a number of crime novellas and a collection of short stories. His next crime title is Artefacts of the Dead.